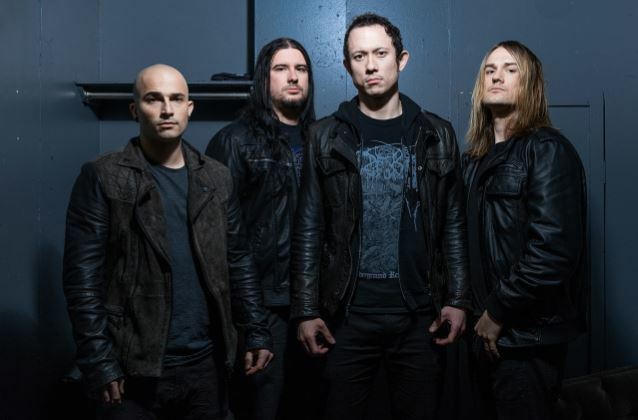 Matt Heafy says that TRIVIUM's last three drummers were nothing more than "session players" but has stopped short of confirming that the band has fired its drummer of the past year, Paul Wandtke. On December 22, BLABBERMOUTH.NET exclusively reported the rumor that TRIVIUM had parted ways with Wandtke and welcomed Alex Bent, a member of BATTLECROSS and DECREPIT BIRTH who has previously played with TESTAMENT as the fill-in for that band's longtime drummer Gene Hoglan. Asked by Metal Insider in a brand new interview what he thinks Alex will bring to TRIVIUM's sound, Heafy responded: "What I feel we need to clarify is that the last three drummers, everyone has been a session drummer within our band. The band has been Corey [Beaulieu, guitar], Paolo [Gregoletto, bass] and myself since the beginning. "As far as the rumors go with who plays with us now, I really like to push with people is that the last time we had an official band member that was a drummer, was Travis [Smith]. While we absolutely wish him well, he's not with us anymore — and that's because of the four of us. The chemistry between the four of us… we weren't able to make something great between the four of us anymore, so we decided among all four of us that we need to separate. Since then, most currently having Paul play with us, the future will always be in the hands of the person on the drum throne. "It's very difficult for anybody to fill the shoes of a legacy and a time. Only time will tell, and we’ve always been up for what the fourth player brings to the table." Heafy went on to reiterate that "the last three [drummers] were session players. Maybe that's the fault of Corey, Paolo, and myself for not saying it more often, but that's just how it was." He added: "We wish nothing but the best for anyone that's ever played with us, but sometimes a session musician is the same idea as the band's sound guy — you're working for the same common goal with them, but those aren't the people in the band." Heafy told Full Metal Jackie's nationally syndicated radio show last year that even after playing with Wandtke for only a few months, it felt as if the drummer had been part of the group for years.